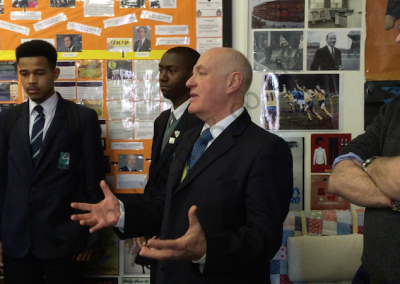 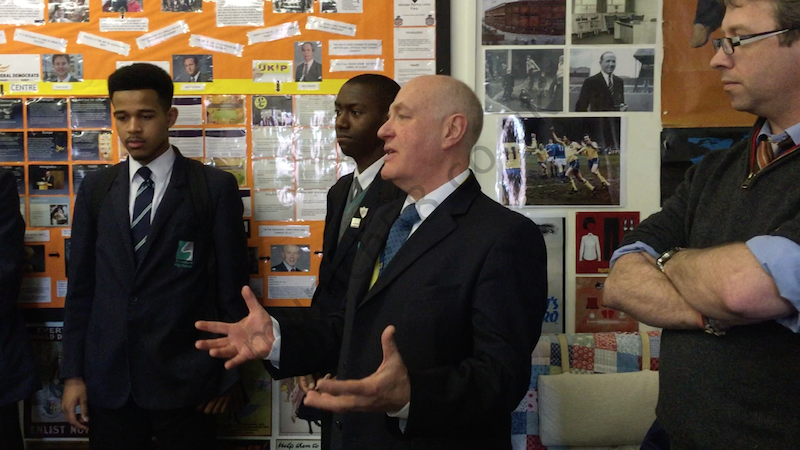 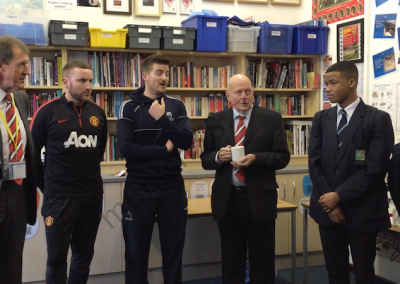 This article is not strictly Munich related however Chris Hirst, a teacher at Stretford High School (and a big United fan) has supported and promoted this website and we have supported and promoted his events including The unveiling of the Blue Plaques for Tommy Taylor and Duncan Edwards. 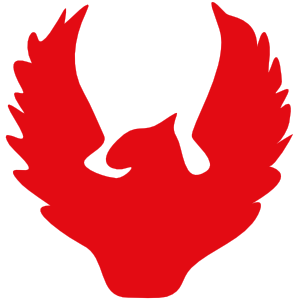 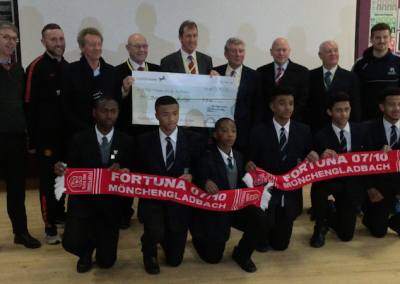 To keep it brief, in January 2014 Chris and his colleagues came up with the idea of organising a football match between a team of kids from Stretford High and a team of similar aged kids from Germany, the purpose of which was to commemorate the famous Christmas truce of 1914. 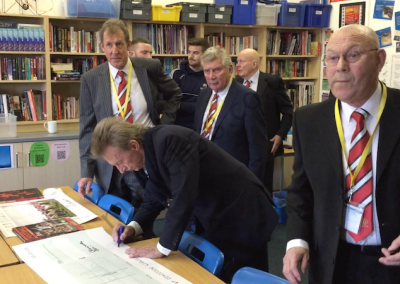 The first game was played at The Cliff (United’s old training ground) in December 2014 with the return leg in Germany scheduled for April/May 2015. 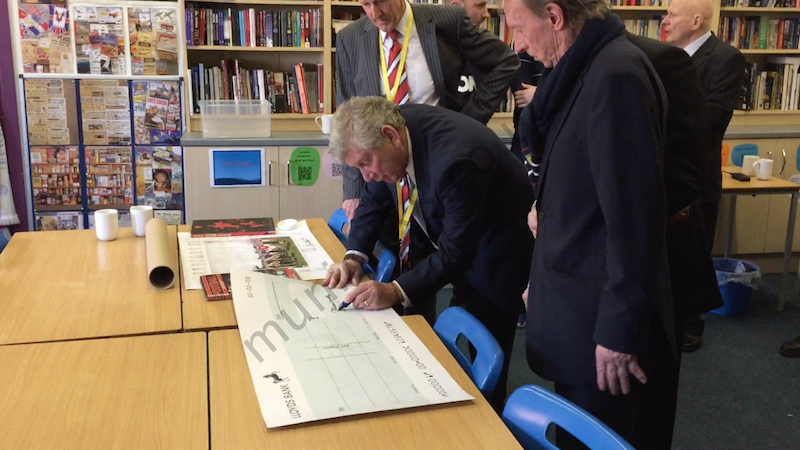 On February 2nd, Chris got a phone call from Alan Wardle (secretary of the “Association of Former Manchester United Players”) to say that they had read about the football match against the Germans and they wanted to make a donation of a couple of thousand pounds to help to pay for the cost of funding the “away leg” in Germany. 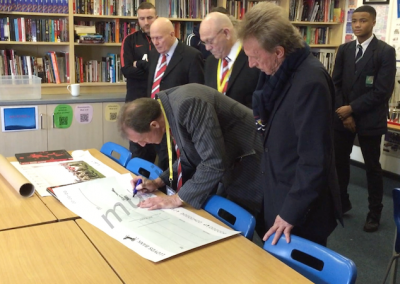 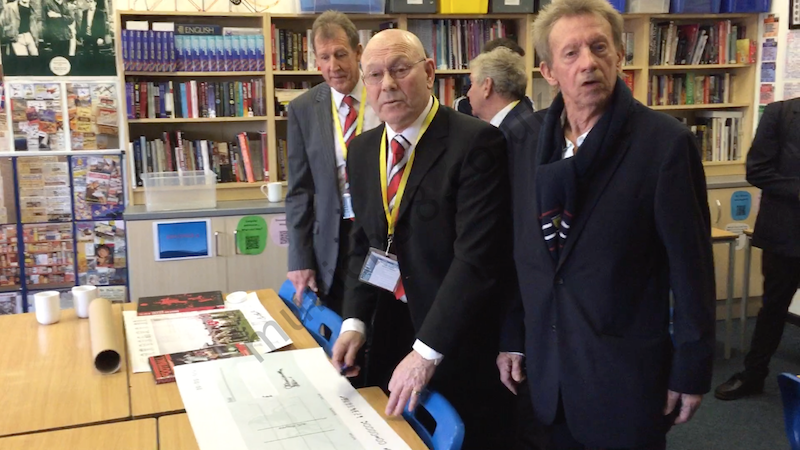 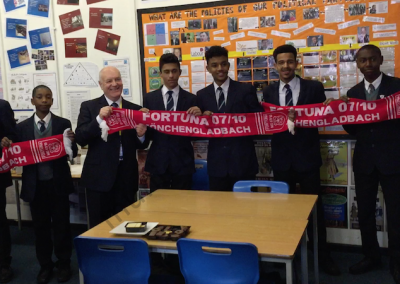 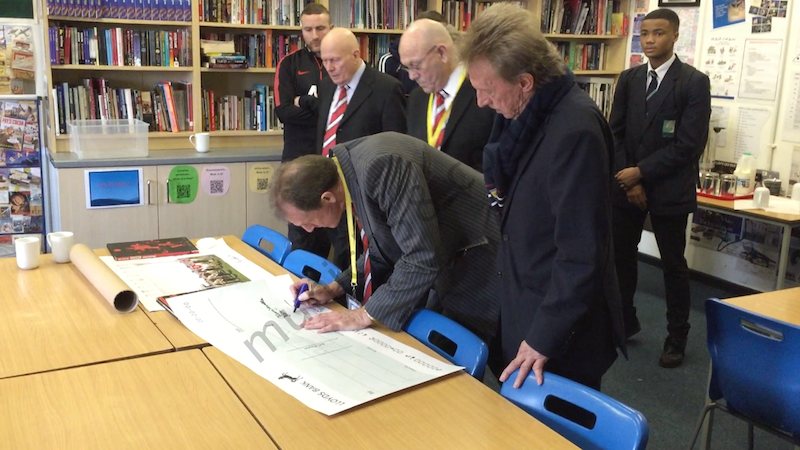 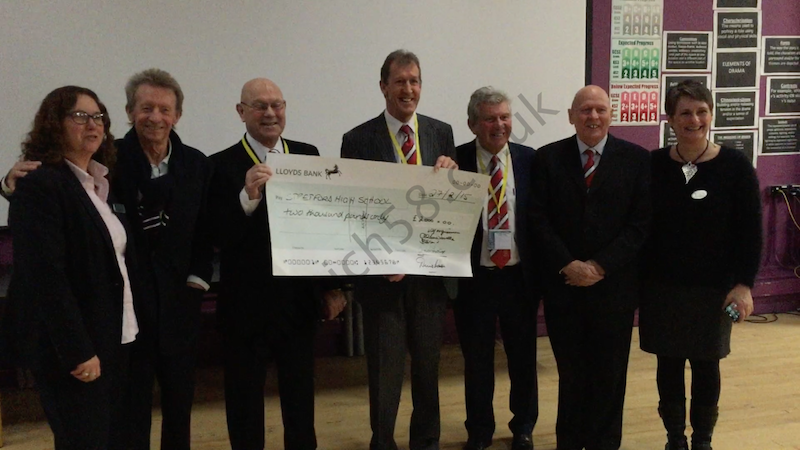 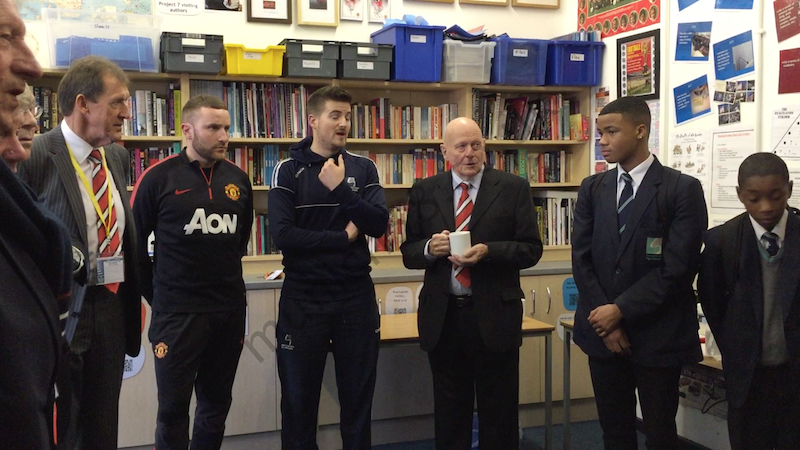 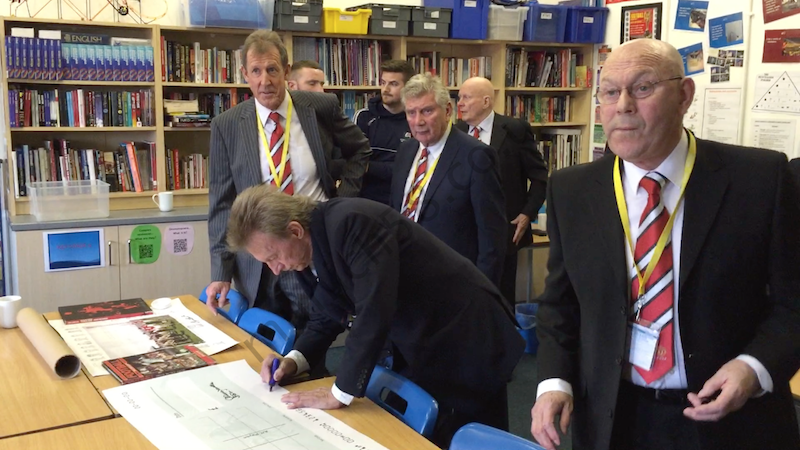 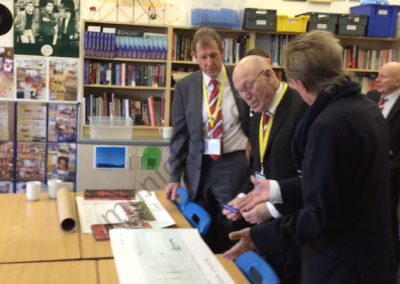 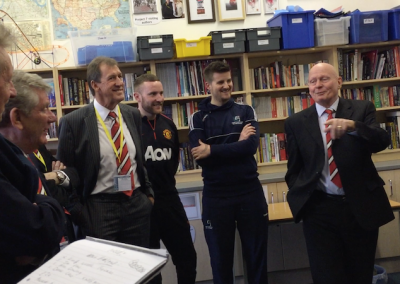 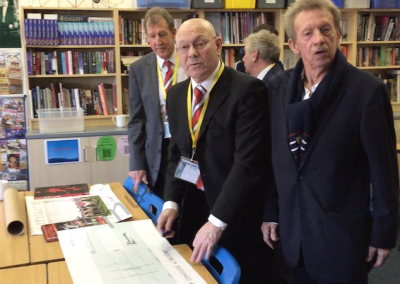 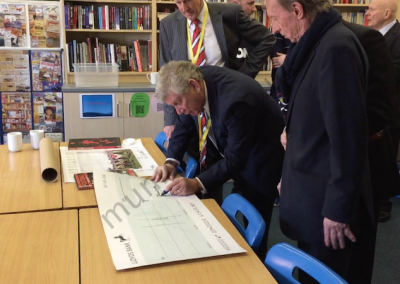 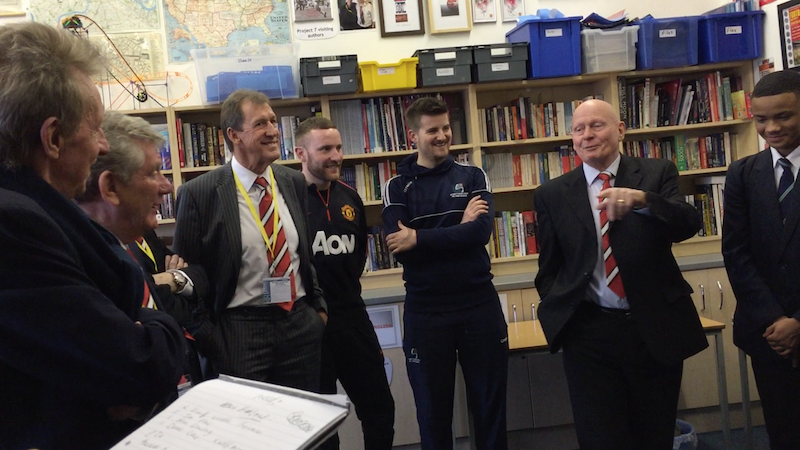 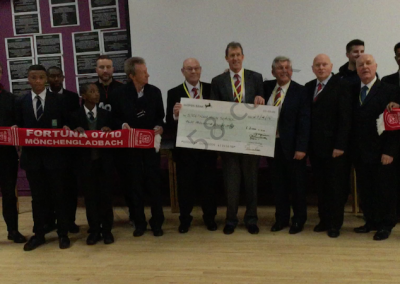 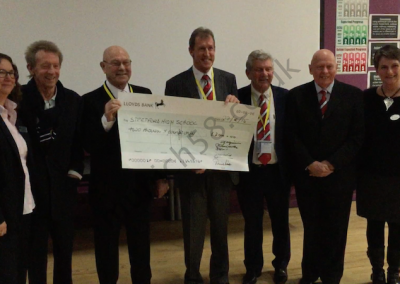 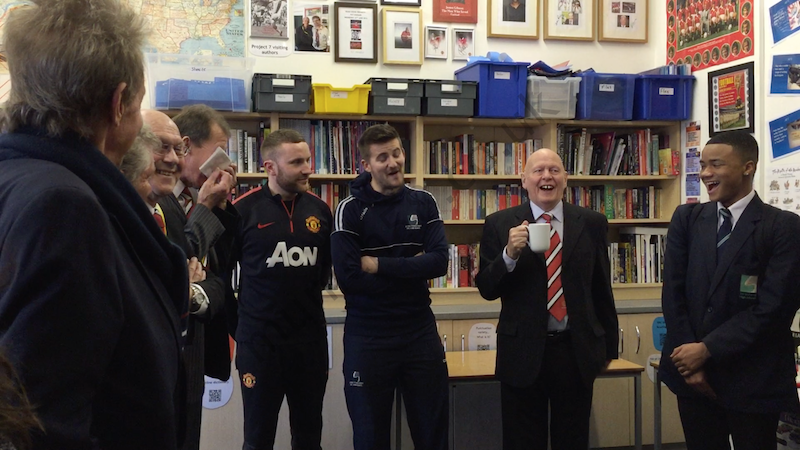 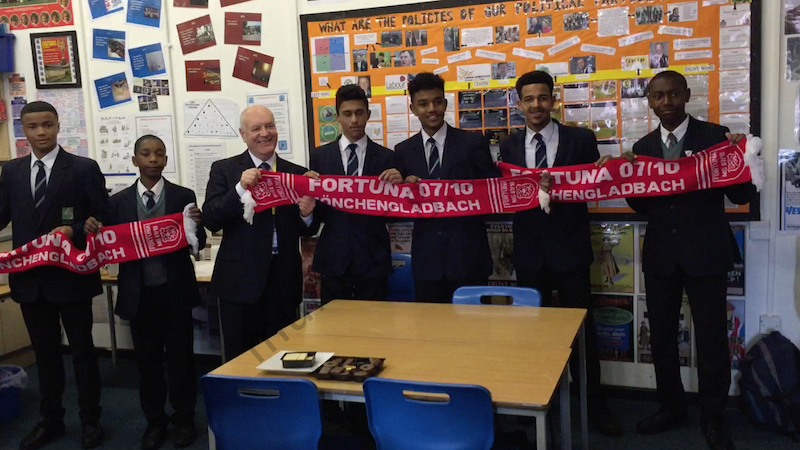 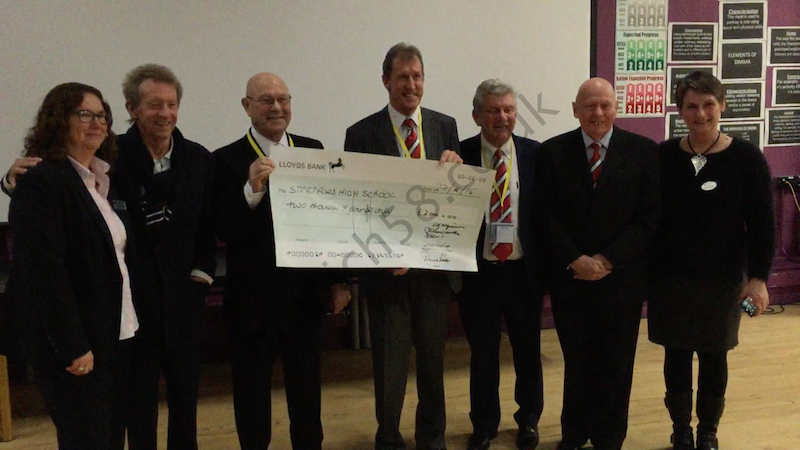 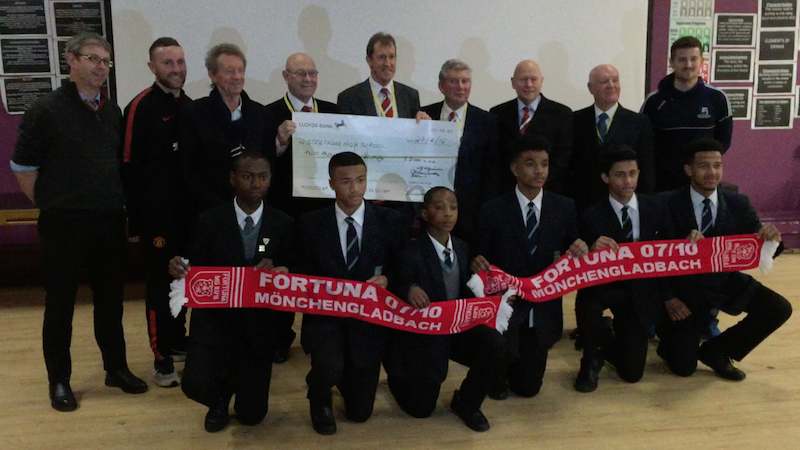 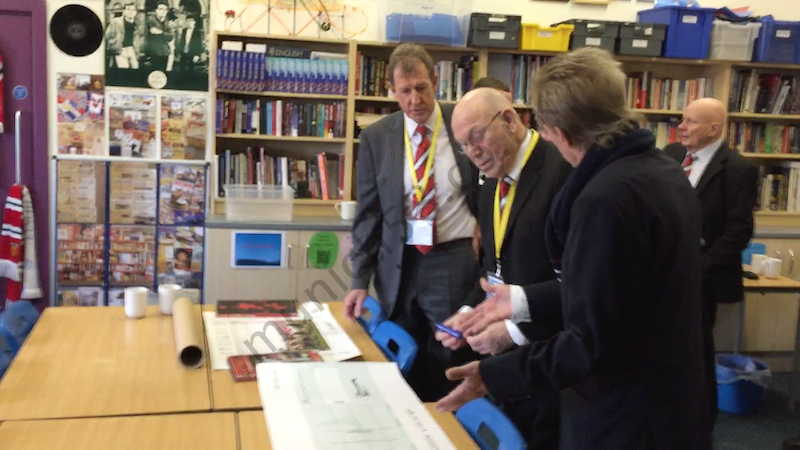 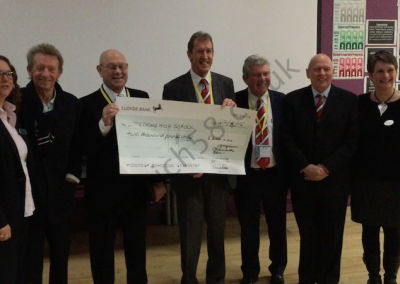 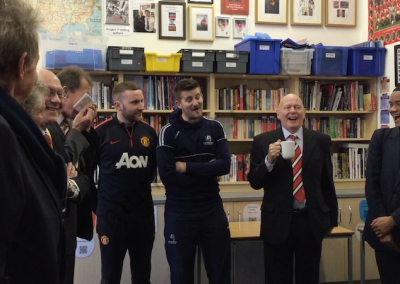 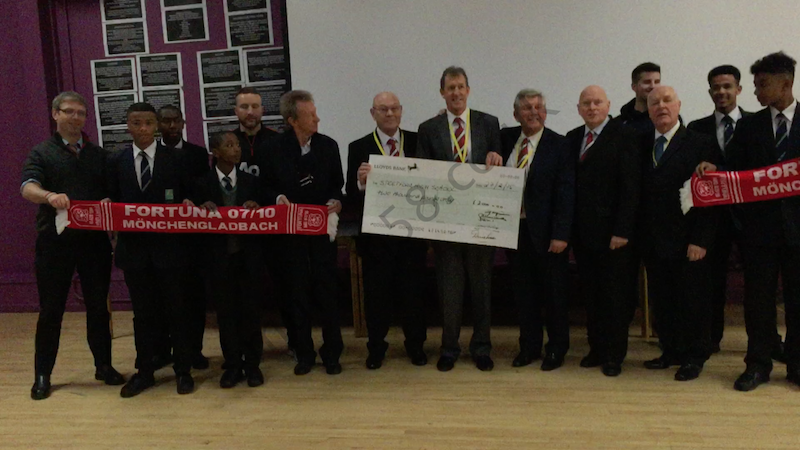 On February 27th 2015, Alan Wardle, along with other ex-United players Alan Gowling, Jim Elms, Denis “The King” Law and Wilf McGuinness went to Stretford High to meet some of the boys who played in the match and to present the cheque.